Vinny Merante and Colin Furlong may compete for play time on the ice, but off the ice, they are great friends. 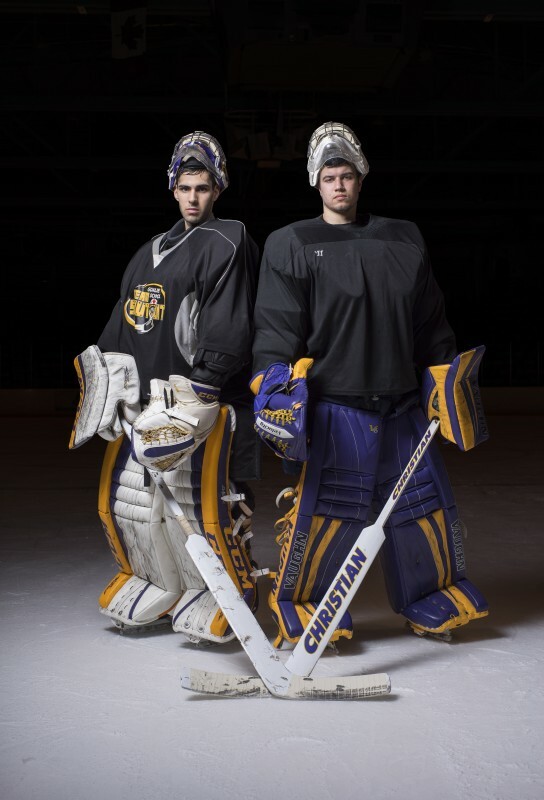 The two Wilfrid Laurier Golden Hawk men’s hockey netminders have nearly identical save percentages, with Furlong holding a .918 save percentage and Merante sitting at .914. Currently, Furlong sits at a 2.92 goals against average while Merante has a 3.08 goals against average. The stepped up and defended the Laurier net with increased intensity and competence that hasn’t been seen in the last several seasons, arguably since Ryan Daniels left the team. The two athletes categorize their dynamic as being great buddies. According to Merante, their friendship goes beyond hockey. Furlong said the reason they mesh so well on and off the ice is due to their different game styles. They approach certain plays differently, too. Merante said as much as it doesn’t make too much of a difference, Furlong catches with his right hand, Merante catches with his left and that because they are bigger goalies, they both like to stay up and take up as much space in the net as they can. The goaltending tandem works well and coaches can sub either out based on either their play or what kind of game plan they are trying to run. The duo of Merante and Furlong compete against each other throughout the week in practice and then one will get the nod for the game. However if the coaching staff feels a need to make a change to spark some momentum, the two has to be flexible in regards to splitting their playing time. The pair said that they bring out the best in each other and that healthy competition goes a long way. “I think we’re subtly unspoken pushing each other. Because regardless, you can be best of friends but as a goalie you always want to play right,” Merante said. Often when players go too long at their position uncontested, they can regress. The added competition between the pair table helps their development as athletes and improves the team as a whole. Merante said with the friendly competition he has with Furlong, it avoids complacency and doesn’t allow any netminder to take their foot off the pedal. The Hawks do not have a clear number one and two goaltender, and Merante and Furlong play best in this way. This also adds a constant state of pressure and evaluation which both players thrive from. This has kicked the goaltending duties into gear this year and allows the team to let the goaltender make plays and focus more on their efforts into the opposing teams end. “It can’t happen in this sport because every day is a battle out there,” Merante said.